Not unexpected, but very sad all the same. Merle Haggard has died of pneumonia today on his 79th birthday. "We need to have music that contributes to the well-being of the spirit. Music that cradles people’s lives and makes things a little easier. The singer is survived by fifth wife Theresa Ann Lane (above) and his six children. A giant has fallen. Country music will never be the same again. Video orbituary from the Guardian. Country is a state of mind, not a state of America. Brad Paisley "There are no words to describe the loss & sorrow felt within all of music with the passing of Merle Haggard. Thank God for his life & songs." Carrie Underwood "Love and prayers for the Haggard family. Merle was a pioneer...a true entertainer...a legend. There will never be another like him." Jason Aldean "extremely sad to hear of the passing of one of the greatest of all time Mr. Merle Haggard." The Band Perry "His are the footsteps we follow in. 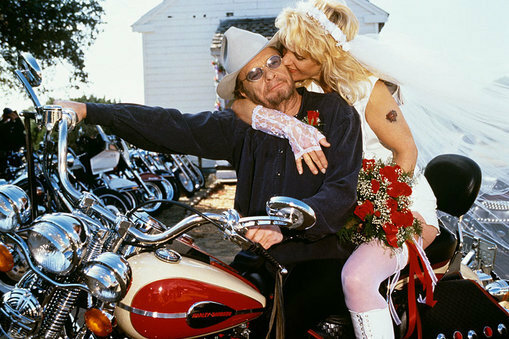 Rest easy, Merle." 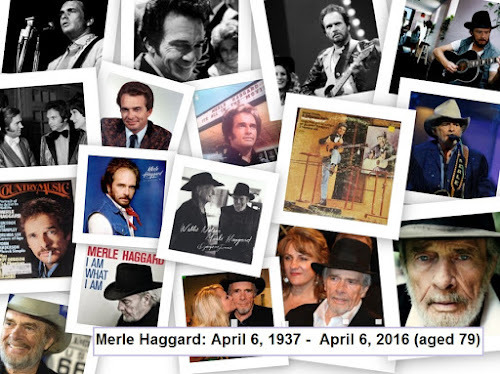 Sheryl Crow "The world will not be the same without Merle Haggard in it. Voice of reason, good man, true American artist. An original." Ron Howard "I had privilege of acting w/him. A fun & gracious man who always had a mandolin or guitar near by." Josh Turner "Pains me to say that country music icon Merle Haggard has passed away. So honored to have known him and shared the stage with him." Trisha Yearwood "Rest in peace, Hag. One of a kind, and the definition of legend." Kacey Musgraves "I think I'll just stay here and drink." Jason Isbell "Merle Haggard was the best country songwriter there ever was." Merle's Final Show*. It was Super Bowl weekend. Merle had already cancelled months of shows, but this particular booking was a big payday. Merle had to pay his band and crew, so there was no calling in sick for this gig. Toby Keith was in town with his wife to watch some football and have some fun. Toby got word that Merle was in Vegas, so he went to see him… Merle was in bad shape. He needed to be in a hospital - not on a stage; but The Show Must Go On. Merle would not take charity from anyone, but he did turn to Toby and say, "How many songs of mine do you know?" "All of 'em" answered T.
"Yep. And I won't need a teleprompter." "Well, stay nearby." After four or five songs, Merle's infected lungs were spent. He couldn't draw enough air to sing any longer. "We've, uh, we've got a special guest here tonight…" Toby came out and sang the rest of the show. Merle gave his last concert. The Strangers got paid. And the audience, while not realizing it at the time, saw something special. Never speak ill of Toby Keith to me; thanks to him, Merle exited the stage with his dignity intact. * I have been informed that Merle played a couple of shows after Vegas, so this was not the FINAL show. I knew he and Kris were set to play a rescheduled LA on Feb 3, because I was missing it due to my travel schedule. I had no idea it was postponed a second time. Whether Vegas was the last show, second-to-last, or whatever, the fact remains that when Merle needed a helping hand, he got one, and the audience was not left wanting. Merle was an artist and a showman until the end. The reason I know about it, is that I phoned T after the Super Bowl to talk football. That's when he told me what happened. Knowing what a Merle fan I am, he sent me this pic. I asked permission to share the photo before I did so.